I am delighted to welcome you to St. Mary’s College, a Catholic, co-educational, K-12 College of excellence located in the town of Broome. With almost 750 students from Kindergarten to Year 12, the College continues to respond to the growing needs of families from our local community and the Kimberley region. Steeped in tradition, our ever growing and developing facilities and beautiful grounds, allow our students to enjoy many academic, cultural, spiritual and sporting opportunities. St. Mary’s College is an inclusive community that enjoys a strong reputation for the excellent pastoral care of our students. The College Staff value the dignity and worth of each and every student and strive to create a positive learning environment in which the individual needs of all students are catered for. Students are encouraged to seek personal excellence and challenged to discover and develop their talents not only for themselves, but in the service of others. Our College motto, listening hearts, and our values of courage, love, empathy, acceptance and resilience are a testament to our commitment to the reconciliation process, our Catholic faith tradition and our acknowledgement that every student is vitally important in our College family. We provide each and every student with a diverse and balanced learning environment within a safe and caring community that we are very proud of. Our College offers a wide range of quality educational and co-curricular opportunities that foster the wholistic development of each student. We offer specialised curriculum for both primary and secondary students that are current, utilise technology and enable our students to be their best and achieve to their ability no matter where they are at on the learning continuum. We provide established pathways for University entrance, Vocational Education and Training programs and cater for students with disability or learning needs in a supportive and caring environment. 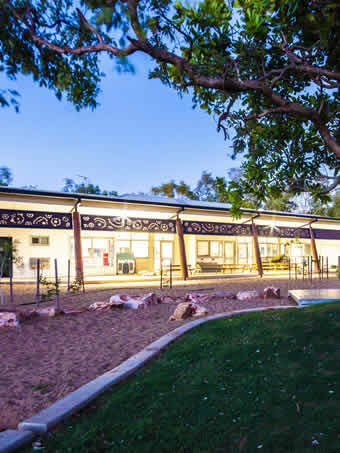 Working in partnership with Broome Residential College, St. Mary’s College is home to nearly fifty secondary boarding students from many communities across the Kimberley. A dedicated team ensures that each students’ needs are met and working in partnership with family and the Residential College so that students have the opportunity to thrive while staying on country for their secondary education. Our College acknowledges the important role of parents and guardians as the first educators of their children. We seek to strengthen meaningful partnerships with parents and guardians as we journey together to achieve the best outcomes for students and ensure our they are ready to take their place in the world post-graduation.